Flashes of gold have started to appear on the foliage around the ‘Boat. 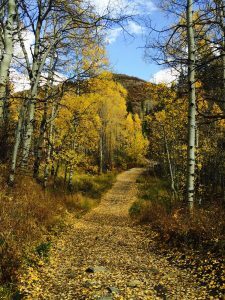 It’s hard to leave another glorious summer, but if you’ve ever been to Steamboat in the fall, you’ll know there is plenty to celebrate. Here are our favorite things to do in the valley before winter shrouds us with snow. Nationally renowned aviators take to the skies of Steamboat Springs, performing thrilling aerobatic stunts and formation flying during Labor Day weekend. Take a ride in a plane or helicopter, listen to presentations by retired military pilots and check out the war birds and vintage aircraft on display. Saturday, Sept. 2. Stock up on outdoor gear and clothing at the end-of-season Sidewalk Sale, when Steamboat’s downtown boutique-owners display an abundance of bargain items outside their stores. Routt County’s scenery explodes in spectacular reds and golds during autumn – take to the roads around Steamboat Springs by car or bike to witness the panoramas in all of their majesty. Follow the flow of the Yampa River with a ride on River Road and travel onto The Flat Tops Wilderness Area Scenic Byway from Yampa over Dunkley Pass and Ripple Creek Pass. Drive up Rabbit Ears Pass to Muddy Pass, which despite the name offers breathtaking photo opportunities. Head north of Steamboat to pass historic ranchlands and their fields of gold along Elk River Road and Seedhouse Road, stopping for homemade treats at the Clark Store. Ride further north, where Hahn’s Peak and Steamboat Lake offer essential viewing of the autumn landscape. Just before the snow falls, join a throng of ghosts, ghouls and goblins at Steamboat’s beloved downtown Halloween celebration. Downtown Lincoln Avenue is closed to traffic and businesses open their doors to an army of trick-or-treaters. Dress up for the event, or opt for a bite at one of the Lincoln Avenue eateries and vote on the best getups as they pass by. Tuesday, Oct. 31, 5-7 p.m.